With a gazillion pictures to go through and 6 weeks left to finish all or our projects this year, it has been a whirlwind of activity as of late. At the same time we are reviewing requests and proposals for next year. 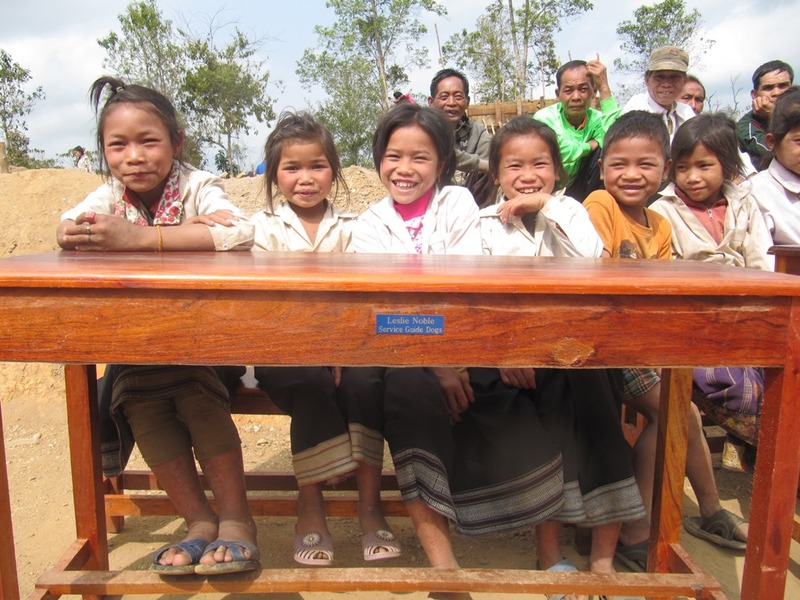 Since our last blog entry, we managed to finish the school and toilets in Katang Xieng, located way up in the highlands above Nong Khiaw, and the water project will finally be completed today so I am told. 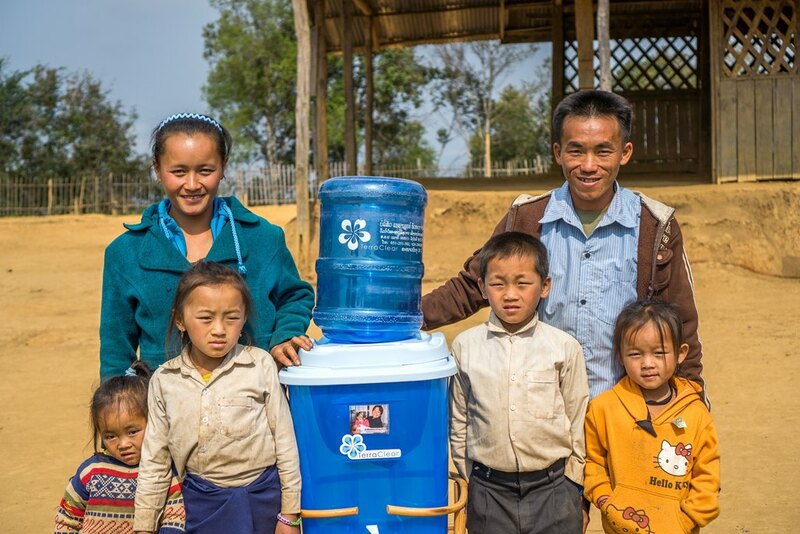 We have also taught hygiene courses and distributed water filters for another 415 families in 5 villages. Woohoo! Our last project is just starting and it is a biggy. We had to delay it in hopes of raising more funds to cover the increased costs associated with our poor Canadian Dollar exchange rate. That alone cost us an extra $30,000+. On top of that we had overages on our budget due to issues way beyond our control. Still, it is hard to believe but we did it! Part of the additional funds received was due to the passing of a very dear friend of ours and so many. 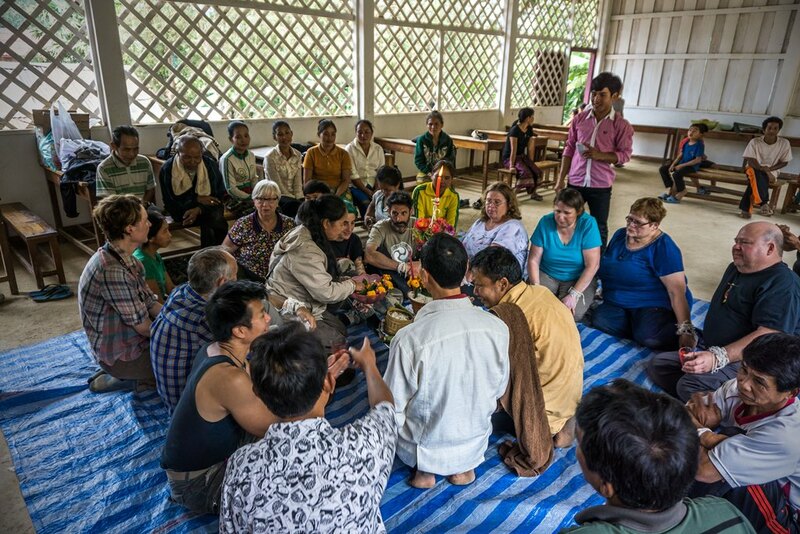 In the spirit of her life of giving and never-ending generosity, the family asked in lieu of flowers that donations be sent to Adopt A Village in Laos. The total to date is well over $5,000. Her memory and spirit will live on forever. 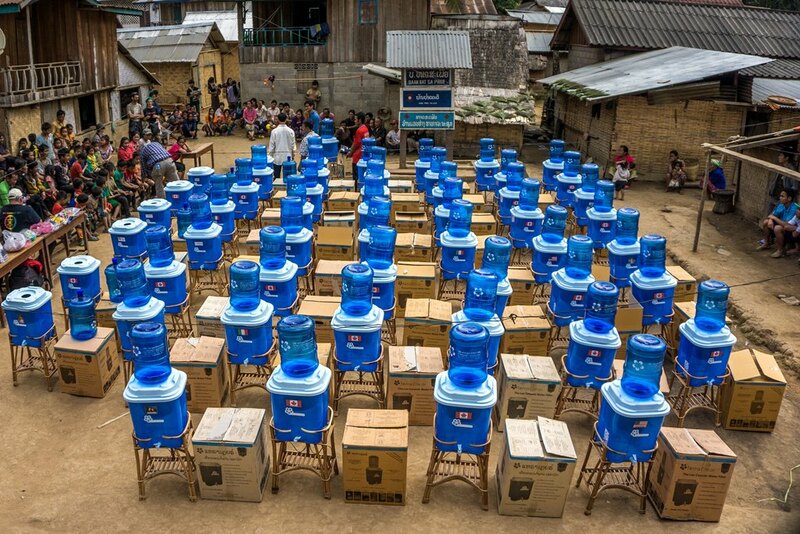 The villagers are strong in their spiritual beliefs and some actually lined up so that when we distributed water filters, Fay Hope’s picture would be on the filter that they got. Her husband Kevin will arrive tomorrow as originally planned before Christmas, but alone. 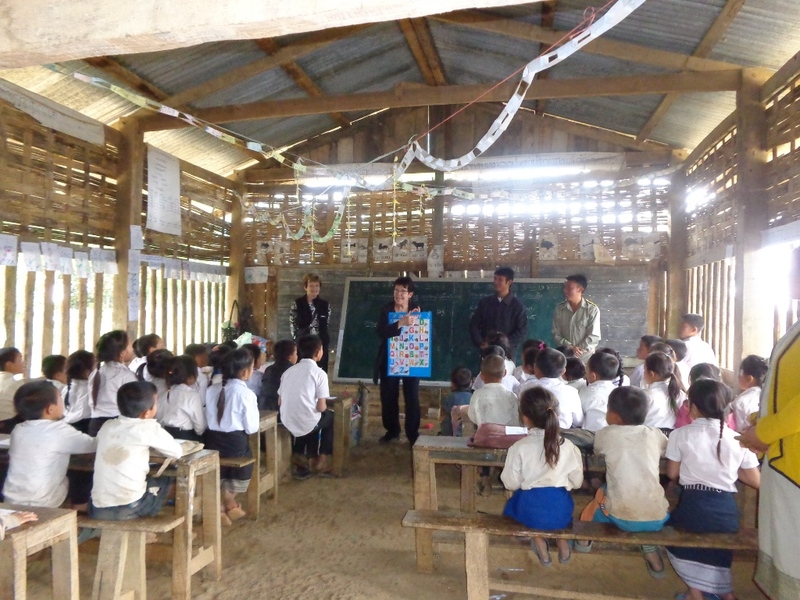 In Loving memory of Fay Hope, distributed to a Hmong family in Hin Pan Village. We had an amazing entourage of visitors from Canada to see and experience the villages receiving our support, and in keeping with the waer filter theme, here are some highlights. 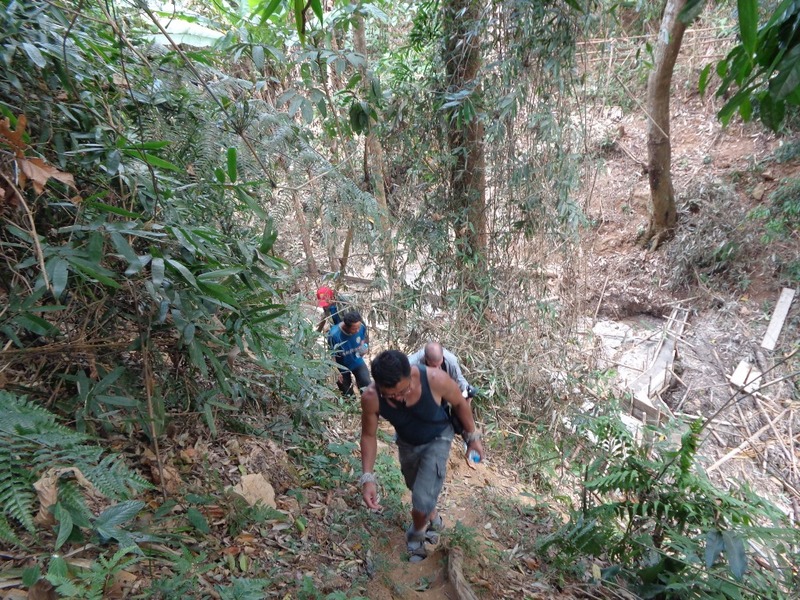 Hat Sa Phuey Village, located up the Ou river about 2 hours north of Nong Khiaw. We certainly filled their village square. While in Hat Sa Phuey we distributed lots of goodies too, with special thanks from all of those who brought an extra piece of luggage! Sport uniforms donated by Afrisoccer and by Vivianne who kindly collected gently used unifroms and T-shirts for us, plus we received hundreds of toothbrushes, toothpaste and dental floss, courtesy of Oral B and others. Mike and Kathy donated the soccer balls. Another baci after the distribution. So far I have been to 9. As part of the spiritual ceremony, each elder will chant and put strings around both wrists. Starting from Mike wearing the singlet, clockwise is mysel, Christine from the London, Ontario area, a local villager, Paulette Mouzer from Port Hope, 3 more locals, then Kathy Storrie from Vancouver, Kathy Dennis and Carol Spier from Port Hope, Mike Storrie, and some of the village elders. It is quite moving for those who have not experienced this before. 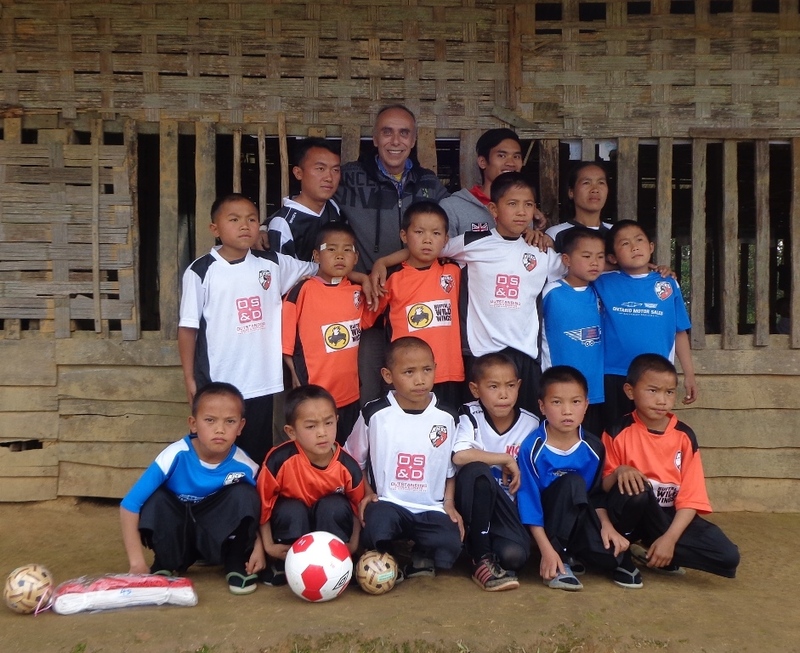 Team Uniforms for the students at the Katang Xieng School opening. 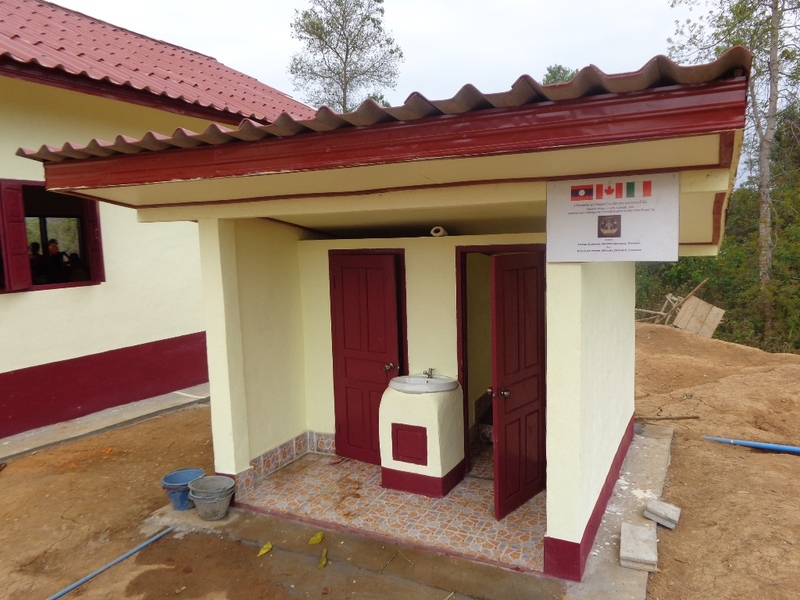 The pictures above and below were taken at the conclusion of our school and toilet project. We were always in a bit of rush to try to complete everything in a day and hightail it back off the mountain to the comfort of our guest houses. Thanks to Afrisoccer for the uniforms, Mike and Kathy Storrie for the soccer balls. Note in the picture above, the old school in the background to the right. This was actually a new temporary school because the old dilapidated school was destroyed in last seasons monsoons. Despite receiving confirmation that there were 72 students, it turns out that there were over 100. So we didn’t have enough for everyone! (we returned another day to give to the students without). 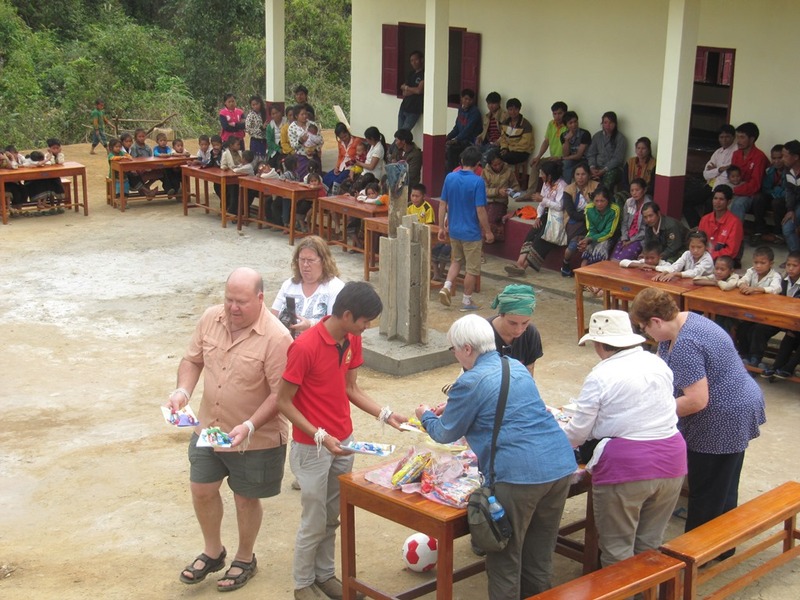 Paulette, both Kathys, Carol and Mike were on hand to distribute school supplies, balloons, candy (just one), toothbrushes and toothpaste to each student. You will see the flag post in the middle – cement was still curing so we couldn’t put up the Canadian flag! Having a bit of fun with the team students who received the sport uniforms. Note in the background the water tank. The cement had just been poured the day before. Water was already running, but not to the tank yet. The desks were donated by the Rotary Club of Bowmanville, resulting in some pretty happy students. Here we are enjoying a group dinner. 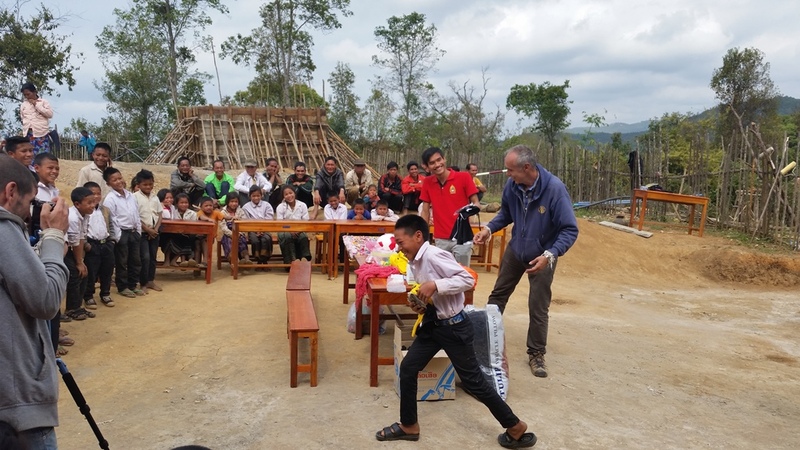 Clockwise is Siphan our coordinator, Claudio, a doctor from Italy, Kathy S, Christine, Carol, Kathy D, Oudone, myself, Paulette, Big Mike, Little Mike, Massimo and Serena from Italy and the largest sponsors for Katang Xieng School. 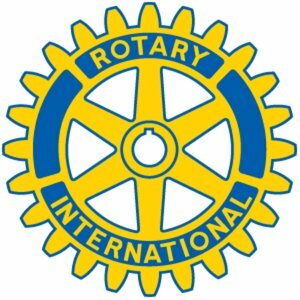 Funds for the Katang Xieng School Toilets were graciously donated by Ink For Charity, Peter Gorham and Doug Byers, both from the Rotary Club of Whitby Sunrise. 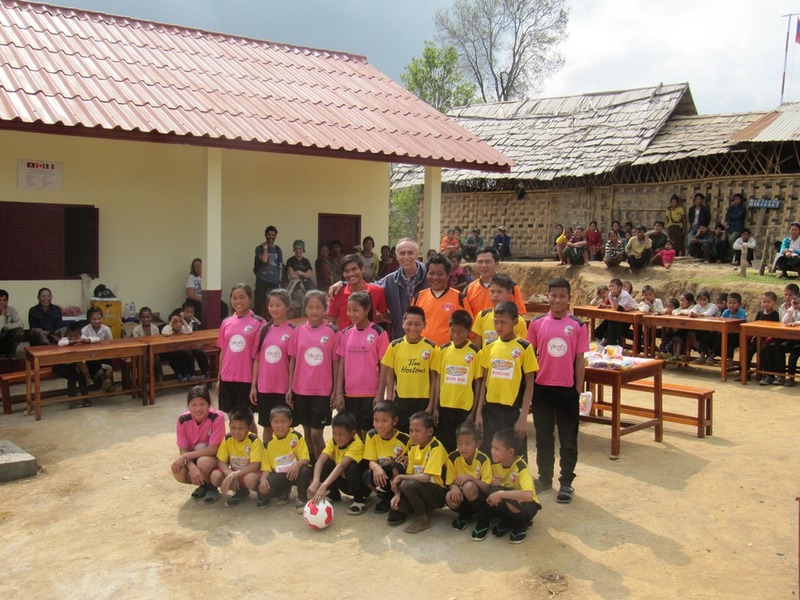 Katang Xieng School Completed! It took a while to get organized there but the kids brought all the desks/tables outside and we held the festivities in front of the school. Despite all of the setbacks with this project, we managed to complete it on time (barely – they were still painting the school as we drove up the driveway!). 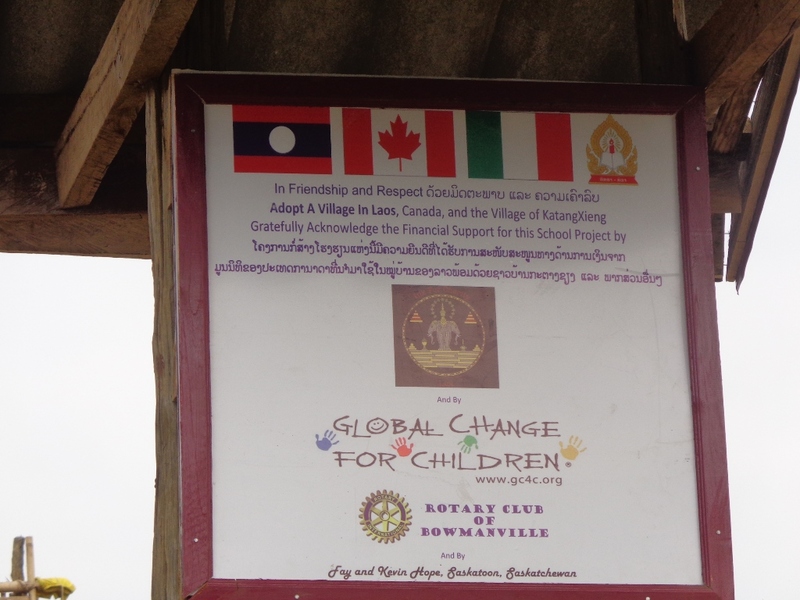 On behalf of the villagers of Katang Xieng, and Adopt A Village in Laos, we gratefully acknowledge and sincerely thank Ink For Charity from Italy, Global Change for Children from Canada, The Rotary Club of Bowmanville and Fay and Kevin Hope from Saskatchewan. Our three year push to make this village more habitable is just about complete with solar power, water filtration, permanent water in the village a school and toilets. Thank you to all who participated in this venture. Within a day of the departure of our large group of guests, Barbara and Leslie from Toronto, who hold a charity bridge tournament for us each year, arrived safe and sound. 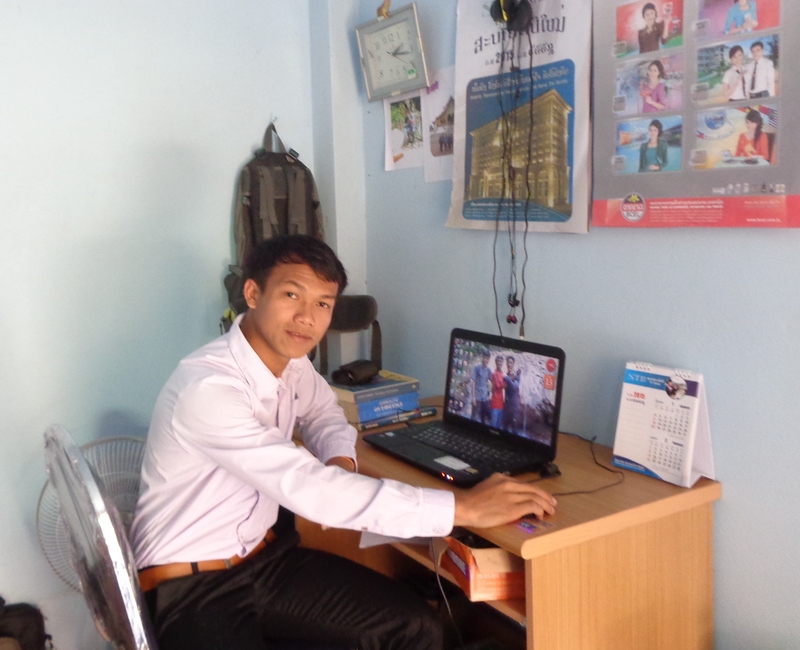 With Barbara Seagrams soft heart, Oudone was the recipient of a new desk and chair for his dormitory! Thank you so much Barbara! Barbara teaches the ABC’s to eager students, and gave out a bag of school supplies to each student with assistants Leslie and Khankeo who came down to assist durng her visit. they had met 2 or 3 years ago. This the village of Phou Vieng. Gee, the number of schools that need to be rebuilt seems never ending. Not to be outdone, Paul from Georgetown sent frisbees and skipping ropes with us. We had to show them how to use the frisbees of course. 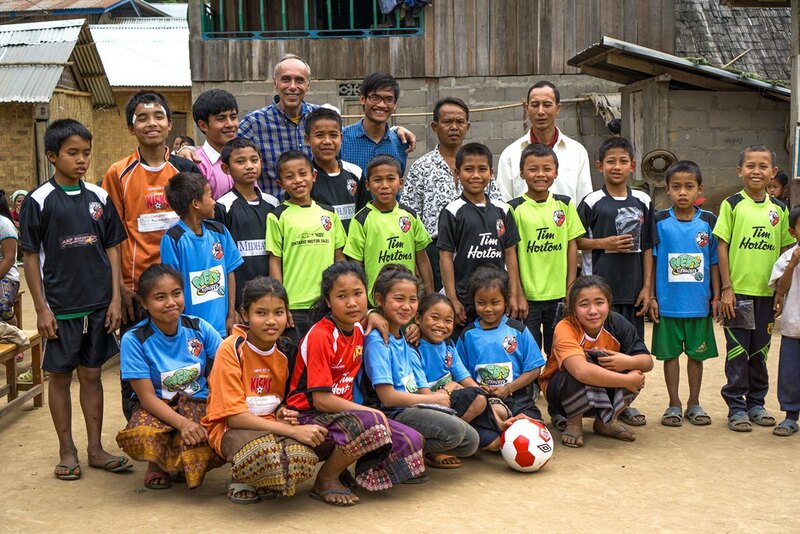 This is Phou Viengs team, ready to play with new outfits, soccer ball, rattan ball and net. We also did a small fundraiser just over a week ago to try to boost our cashflow in lieu of the low Canadian Dollar. It was a lot of work but I think everyone had fun. We had a raffle and tons of food, enough for an army I think. Barbara and Leslie selling raffle tickets to the guests. 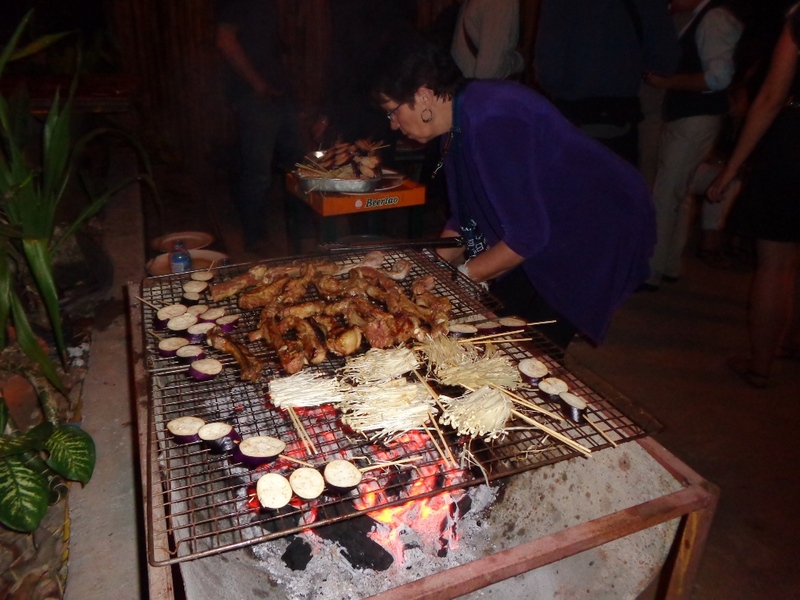 Wow – Barbara tending to the barbeque! So much food! 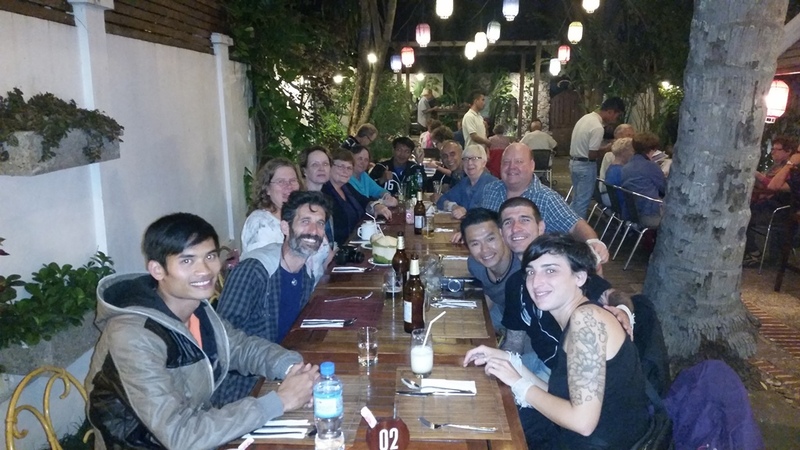 We returned to Katang Xieng after the departure of our wonderful friends. 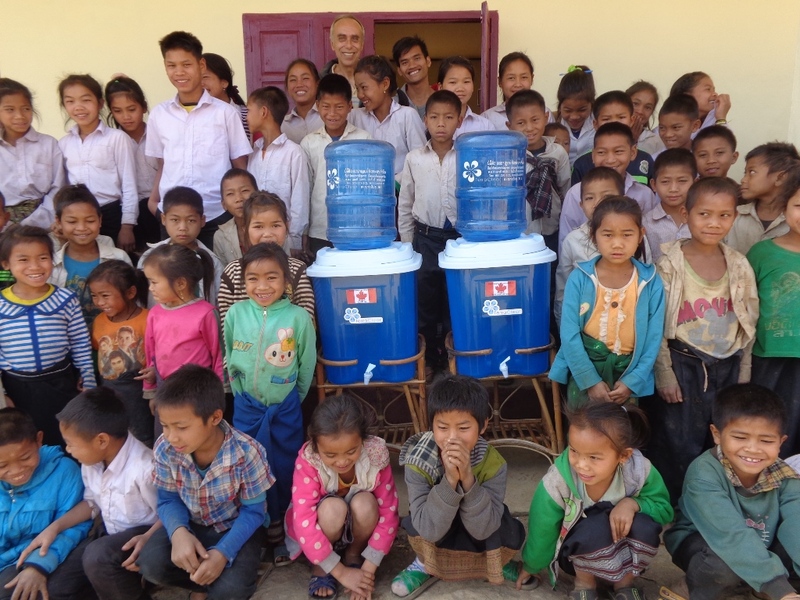 We had forgotten to take up the water filters to the school for the opening. 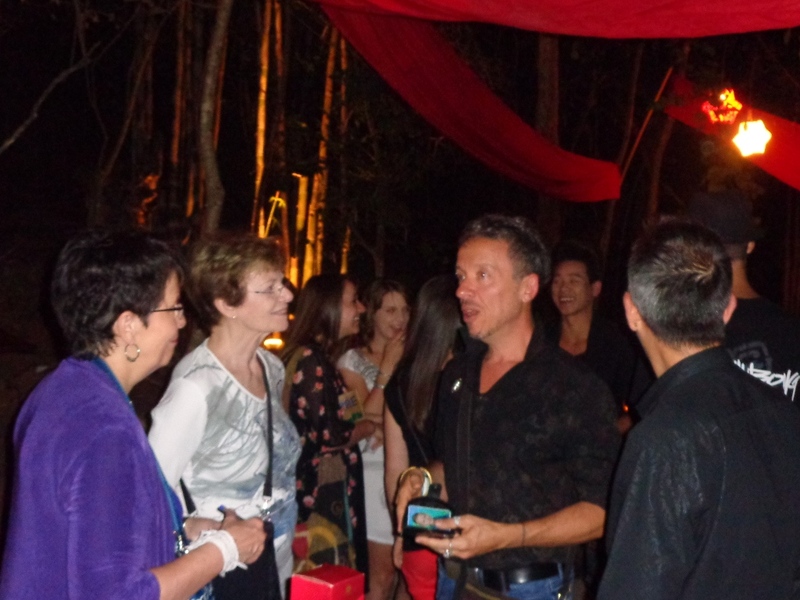 Preet Pall from Global Change for Children was the wonderful donor. I love watching the kdis reactions when we offer something. They are so respectful with their thanks. 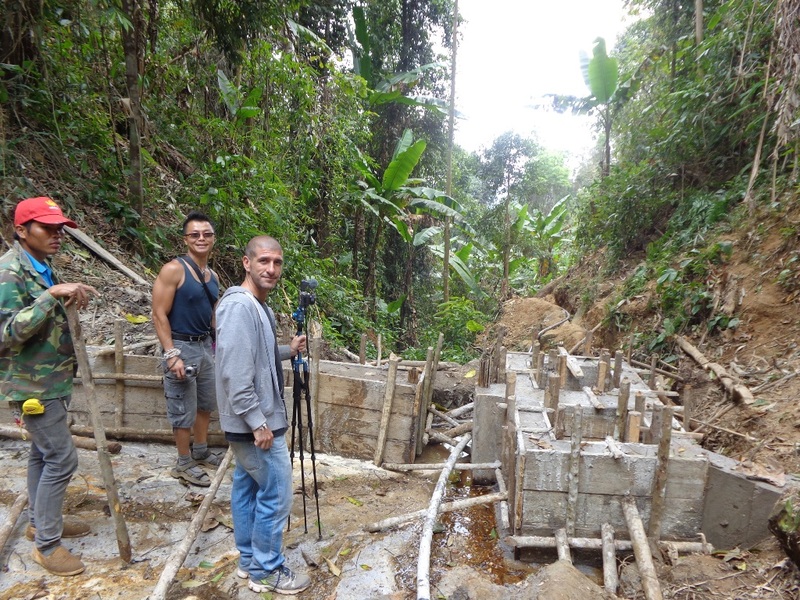 While at the village, and with a bit more time on our hands, we took a trek to the new dam. Not easy! The cement was still curing at the dam but I am told it is finished now. We will have more updates soon.